For Julia Glushko, Tuesday was a day of firsts on Court 6 at the US Open as the Israeli came back to beat Monica Niculescu 3-6, 7-5, 6-4 in first-round action. It was the first truly hot day of the tournament; it was the first day using the Hawkeye electronic replay system where umpire’s calls may be challenged, the first match for Israel’s Glushko where on-court coaching is not permitted (it is allowed in the qualifying tournament but not in the main draw); the first day where some members of the crowd were loudly cheering for her tricky, forehand slicing Romanian opponent, Niculescu; and it was the first day when Glushko appeared in danger of defaulting mid-match due to an injury. But the new-and-improved Glushko is adaptable and she is a fighter and was determined to play to the bitter end. Glushko, ranked No. 162, took on Niculescu, currently No. 62 in the world, though Niculescu once reached a career high of No. 28 in singles in 2012, spent significant time in the top 50, has reached a high of No. 11 in doubles and played in the Wimbledon doubles finals in 2017. Niculescu’s unconventional style of play, consisting of an extreme grip, a topspin backhand and an unpredictable forehand slice is different than nearly every player on tour and takes some time for opponents to learn and master. And her first serve percentage – 92 percent in the first set to Glushko’s 54% – is one of the highest in tennis. Glushko quickly learned Niculescu’s style, often hitting deep to her backhand to avoid her deadly slice forehands. Glushko also attacked the net more often than usual. Neither player held serve until Niculescu held in game 5, broke Glushko and held again to go up 5-2. Glushko managed one more game before being closed out 6-3. Glushko came out fighting in the second set and appeared on course for a major turnaround. Glushko served and won the first four games to go up 4-0. Then Glushko had what appeared to be a freak, nearly match-ending injury. She collided with the net post with her left knee and came crashing to the ground. She remained on her back, audibly crying, with her left knee up. A compassionate, quick thinking Niculescu was the first responder, bringing ice and kind words to her opponent as Glushko awaited more proper medical attention. To the crowd’s astonishment, Glushko returned to action following a medical time out, her left knee wrapped extensively. While Glushko favored the leg slightly, she returned to action at her usual high level of play. She gave up two games before holding serve to go up 5-2. It was Niculescu’s turn to go on the offensive, as she battled back to 5-5 before Glushko mustered enough strength to close out the 69-minute set 7-5. Both players got a fresh start with a required 10-minute break for changing outfits and a bathroom break. Glushko abandoned her tennis whites for a black shirt and white skirt, though the 28-year-old Israeli began the third and decisive set down 2-0. Aggressive play, careful shot placement and long rallies brought the set to 4-4. Glushko inched ahead to go up 5-4. The crowd, evenly split between pro-Israel Glushko supporters and pro-Romania Niculescu supporters nervously awaited the outcome of game 10. 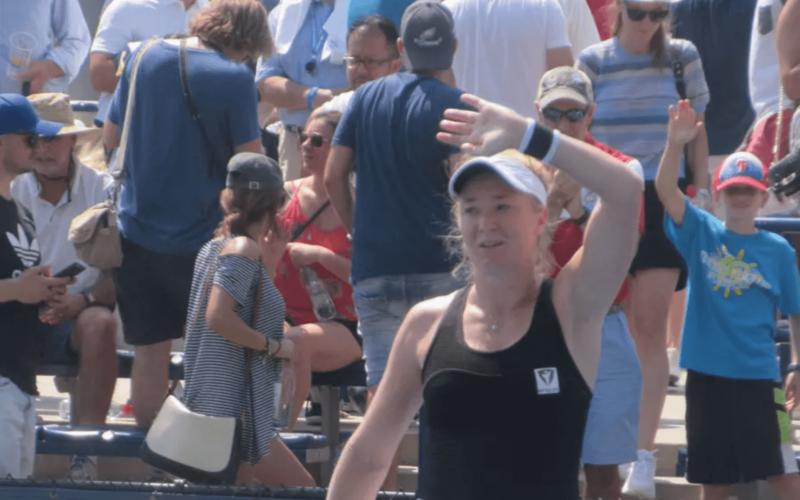 Glushko, on her back injured and wailing just one set earlier, closed out the 55 minute set and fell to the ground – this time with tears of joy. Coach Keren Shlomo acknowledged that Niculescu was an especially tough opponent due to her tricky slices. “Julia played very well first set, she hung in there, and was very aggressive – and she pulled it off,” said Shlomo, who admitted feeling nervous when Glushko fell to the ground. “She pulled through in her mind and heart and did it well. “ By winning the two hour, 38 minute first-round match, Glushko moves on to the second round and is guaranteed to receive $93,000. If she beats No. 20 seed Naomi Osaka of Japan to advance to the third round, she earn $156,000. The US Open remains the richest purse in tennis with total compensation of $53 million. The male and female singles champions each earn $3,800,000. In other action, former world No. 1 Caroline Wozniacki cruised past error-prone Samantha Stosur 6-3, 6-2 to reach the second round in Flushing Meadows. Also, Jelena Ostapenko sweated out a 6-4, 4-6, 7-5 win over German Andrea Petkovic to reach the second round as the thermometer pushed towards 100 degrees Fahrenheit (38 Celsius). Jewish-American men’s No. 139 Noah Rubin was beaten by Russian Mikhail Kukushkin 6-3, 6-1, 4-6, 7-6(3) in their first-round duel.